We’ve had a busy time working on our current Inquiry study on local plants. It’s been beautifully timed with the gorgeous early summer weather we’re having right now in the Lower Mainland and so many flowers are in bloom. This is one of our favourite units to teach as Christy and I are both avid gardeners ourselves, and we love to share our passion for plants and growing things with our students. We try to teach by theme and connect as much across the curriculum as we can to give a rich learning experience for our students. We love it when the vocabulary and content can be tied together within the curricular competencies. 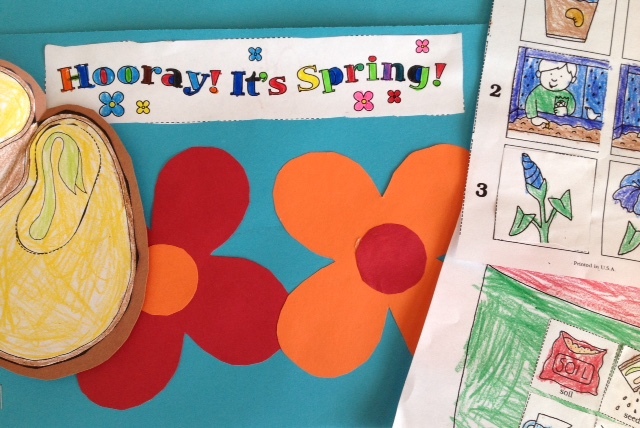 So for our most recent round of “Sharing and Special Helper,” we asked all the children to bring in a “Sign of Spring” and many of them brought their favourite plants or flowers from their gardens. 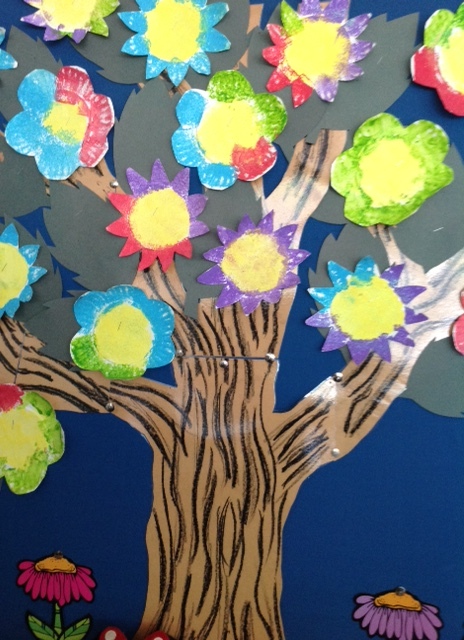 Our students brought in rhododendrons, azaleas, tulips of all colours, daffodils, bluebells, wild poppies and a huge blossoming branch from an apple tree. By the time we started our plant study, our class had all been exposed to a great variety of flowers and shrubs. This is particularly important so that we have some similar experiences to refer to during our lesson discussions in the days to follow. As we’ve mentioned earlier in our previous weekly newsletters, we started our Inquiry with a walk around our extensive school grounds. We stopped to name and discuss some of the plants we have growing in our school garden, and if the children had those same plants at home. We listened for birds and the sound of our creek. We also heard the springtime sounds of construction and lawnmowers. 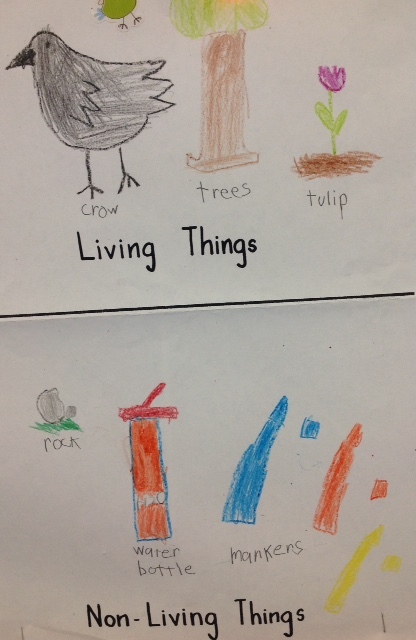 Back in the classroom, we read Living Things, by Melvin and Gilda Berger, to help reinforce the idea that living things grow, need food and often look like their parents when they grow up, as opposed to non-living objects. We recalled the things we had seen on our walk, looked around for everyday things in our classroom and sort and categorised those items into living and non-living things, which the children recorded on their charts. In our next lesson, we read the delightful chapter, “The Garden,” from Frog and Toad are Friends (Arnold Lobel) which sent everyone, including the teachers, into hysterical laughter as Toad tries to grow his garden as beautifully as Frog. After yelling at his seeds to GROW, Toad thinks he has scared his planted seeds so they are now afraid to grow. Toad reads stories, poems, plays music and keeps the seeds company in the evening with candlelight. The children concluded (and knew) that water, air, soil, food, time and love are essential plant needs. Time for a Mystery Box Inquiry! 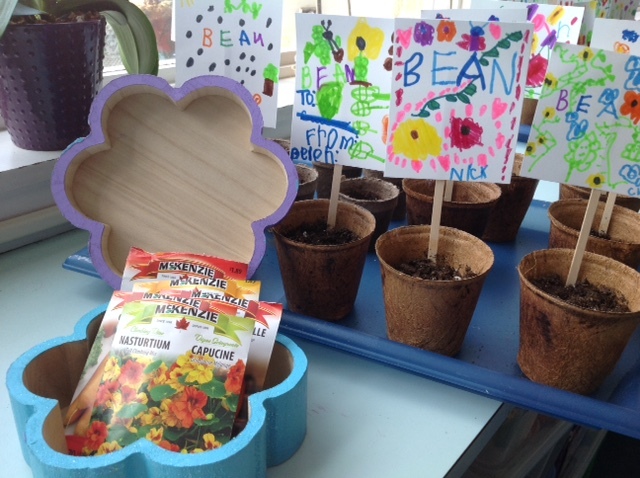 We placed a variety of seeds in the Mystery Box. The children asked some great questions to determine what was inside. Even better, we had the first “checking questions” being asked…questions the children asked to confirm whether their idea was correct, or not. Wow! Talk about amazing curiosity and wonder. The children loved sorting the seeds into groups and then matching them to the seed envelopes. We made our own seeds from a National Geographic learning resource we had on seeds. 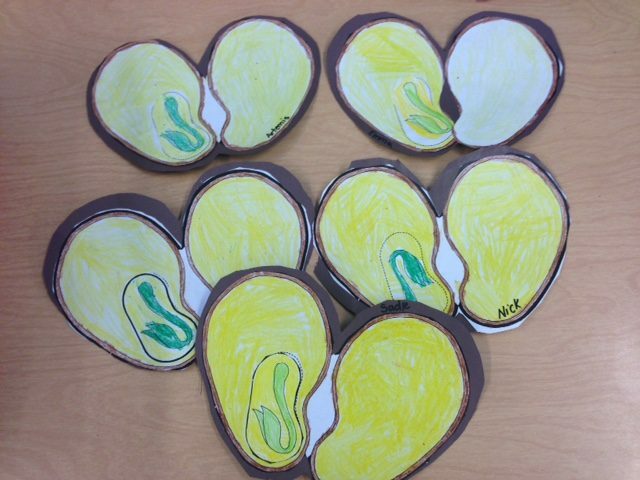 We are enlarging our vocabulary to include seed coat, plant embryo, roots, stem, seedling, leaves, blossoms, germination and pollination. 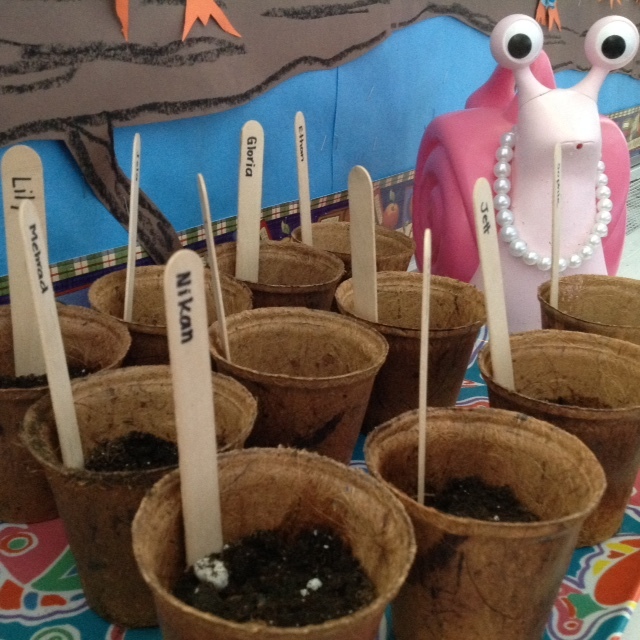 The most exciting part of learning about plants, of course, is to plant our own seeds. We’re growing Scarlet Runner beans because we can count on them to sprout (favourite word in the Kindergarten right now) quickly. We purchased small compostable pots and brought in a trug full of potting soil and a small potting trowel. After a few mishaps …lots of soil on the table and floor… we quickly realized a quick lesson on how to handle the trowel was needed. Here are our beautiful little pots with their bean plant markers. That’s Miss Pink, by the way, our trusty snail watering can, looking on. We’ll follow up in a newsletter with how our beans have grown. When thinking about the integration of curriculum, our bean plants will be a useful reference point when we teach “Jack in the Beanstalk” from our Fairy Tale literature unit, so the children can imagine where the giant’s castle is located. By the time you read this post, we will have taught our last lesson on how seeds travel. We’ve learned over the past few weeks from a variety of books that seeds can travel by air, water, on our clothing or dropped by animals after eating the surrounding fruit. We were fortunate to have dandelions which had gone to seed brought in for Sharing and the children were all very familiar with what happens when they blow on those “puffballs” and how the seeds travel. Some of the children also knew about seeds clinging to their clothes after forest and meadow walks. Here’s our current book list of plant books that we’ve been reading aloud to our classes, and some other beautiful stories with gardening and plants as interwoven themes. We’re hoping you and your little gardener enjoy many happy years of gardening and reading together!